Cycle country roads that lead to charming Provençal villages, where local chefs will gladly share warm hospitality and the secrets of regional French specialties. With country roads that wind through villages, vineyards, olive groves, forests, and lavender fields, Provence has become a paradise for touring cyclists and foodies alike. This trip includes culinary highlights that range from splendid Mediterranean feasts to Côtes-du-Rhône wines, exquisite olive oils, Provençal herbs, and local cheeses. France’s country roads will lead us to discover the secrets behind the local artisans’ savoir-faire. As we pedal from one charming village to the next, we’ll have the chance to taste regional specialties at the home of a local chef, and we’ll visit the places where Van Gogh and Cézanne painted some of their best-loved works. We’ll find ourselves in the shadow of Roman architectural masterpieces, and we’ll enjoy panoramic hilltop views from the villages of Lacoste and Bonnieux, to name a few. We have several two-night stays, which will allow us to settle into the landscape, the flavors, and the essence of Provence. With country roads that wind through villages, vineyards, olive groves, forests, and lavender fields, Provence has become a paradise for touring cyclists and foodies alike.This trip includes culinary highlights that range from splendid Mediterranean feasts to Côtes-du-Rhône wines, exquisite olive oils, Provençal herbs, and local cheeses. We’ll meet at our hotel in the historic center of Arles around 2:00 p.m. to fit bicycles. Then we’ll do a warm-up ride to some of the local sights around Arles so we can get to know our bicycles. Among this city’s treasures are the ancient Roman and medieval Romanesque monuments, which are listed as UNESCO World Heritage Sites. The Romans built a bridge over the Rhône River at Arles during the first century BC, and today the city has a well-preserved Roman amphitheatre and an arena that’s still used for Provençal bullfights. After a pastis, a local, anise-flavored apéritif, we’ll enjoy our first feast of traditional Provençal dishes. Arles hosts one of the largest outdoor markets in France on Saturdays. As we stroll the Boulevard des Lices, we’ll find vendors selling fresh cheese, white asparagus, strawberries, and apricots in the spring. In fall, game birds and a glorious array of wild mushrooms are for sale. During most seasons, shoppers can choose from artisan baskets, exotic spices, and lavender soaps and perfumes. Today we have the opportunity to interact with the vendors as we’ll be accompanied by a local chef, who will then take us to his home for a cooking class. The lesson concludes with lunch, during which we’ll enjoy the fruits of our culinary labors. Although what we cook depends on what’s in season, one possibility is a local beef stew, Daube de Taureau, a Provençal version of Beef Bourguignon. Its uniqueness comes from using local products, such as olives and beef from bulls (bullfighting is popular in Provence), marinated in Côtes du Rhône wine. This chef’s version is influenced by Roman and medieval recipes, so it includes exotic spices as well. Today we’ll enter the heart of Provence where language and culture have been best preserved. The small villages we’ll pass through as we tour the countryside are as authentic as they get. We’ll encounter farmland first and pass a lovely Romanesque chapel, Saint-Gabriel of Tarascon, that peeks out from between olive and cypress trees. The rest of our route is at the foot of the Alpilles hills, and we cycle through orchards and olive groves. There’s no better place to end today’s ride than Saint-Rémy, a town that’s bursting with colorful cafés, historic monuments, museums, and restaurants. We’ll sample the creations of a chocolate maker who uses local and seasonal ingredients, and we’ll pair the sweets with local wines. (We’ll make it a blind tasting to put our taste buds to the test!) Lunch will be on your own: choose from a variety of cafés and sit-down restaurants—or stop into a marché for picnic supplies. We’ll enjoy an exceptional dinner together this evening. Our seasonally fresh meal will include local olive oil from Les Baux, ratatouille (which is Provençal), free-range capon, a cheese course, and dessert. Wine will be from the Les-Baux-de-Provence AOC, the first French wine region to regulate that all vineyards be farmed organically. Activity & Distance: Cycling 17 miles. Negligible elevation gain. Our ride today takes us to the fortress of Les Baux and through the same pastoral landscapes that inspired Vincent van Gogh’s paintings. We’ll make a short, steep climb to get to the rocky crag where the lords of Baux ruled the valley for 600 years, and we’ll be rewarded along the way by a beautiful route that winds into the Alpilles hills through pine forests, amazing rock formations, and old Roman quarries. Along the way, we’ll visit an olive press and taste the oil from the olives grown organically in the area. When we arrive inthe village of Les Baux, your lunch choices range from a quick sandwich to a gourmet Provençal feast. There’s a fantastic candy shop and plenty of ice cream in town as well.Afterward, there’s an extended loop ride available for those who desire to pedal farther through the glorious countryside and to the pretty village of Eygalières. Either way, our ride ends back in Saint-Rémy, where you have the rest of the day to relax or explore. In this town, Van Gogh lived in a mental hospital for a year (1889–1890), during which he worked on some of his most famous paintings. Wandering the town, you’ll see scenes he captured on canvas. Dinner tonight is on your own. Activity & Distance: Cycling 12 to 29 miles. Approximate elevation gain: 1,500 feet. Today we pedal into the Lubéron Regional Natural Park with its spectacular hilltop villages, and we’ll enjoy valley views as we wind down through countryside to reach the village of Fontaine-de-Vaucluse, built around the mysterious spring of the Sorgue River, which surges out from underneath a towering limestone cliff. This region is famous for its melon, and we’ll tour a local farm and chat with the farmers about what makes their produce so special. Is it the soil? The sunshine? During our fall departure, there may still be some ripe melon we can taste right at the source. Lunch today is a picnic with fresh produce, sliced meats, goat cheese, and tapenade, the local olive spread. The more active riders have the option of taking a quiet, scenic road to the beautiful 11th-century Cistercian Sénanque Abbey this afternoon before meeting for dinner this evening. We’ll see how being in the Lubéron region—in a different terroir—brings out different flavors in the local wine. Though most wines in the region are made from the same type of grapes, we can taste the unique differences. Activity & Distance: Cycling 38 miles. Approximate elevation gain: 500 feet. We’ll see one of the most unique villages in Provence today as we discover the vibrantly colored ochre cliffs of Roussillon. The rocks’ palette of reds, yellows, and every hue in between makes you feel as though you’re in a painting. We’ll take some time to watch how the mineral pigments are extracted to make dyes that were once exported all over the world and used to color houses. In Roussillon, you might wish to cap off lunch by sampling the lavender ice cream. Another destination is the village of Gordes, one of the most beautiful villages of the Lubéron—and one that’s literally built into a rocky cliff. On the outskirts of Gordes is a collection of dry-stacked stone huts (called bories) used historically by shepherds and agricultural workers. 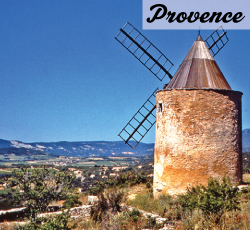 Our stop at this open-air museum gives us a fascinating glimpse into the Provence of the past. Tonight, you’re free to explore Fontaine-de-Vaucluse and to choose your own restaurant; the tour leaders will recommend their favorites. Or, if the weather is good, you could enjoy an evening picnic right on the banks of the river that flows through the hotel grounds. Today, we have a more challenging, but highly rewarding, ride today to one of the Lubéron hilltop villages (Ménèrbes, Lacoste, Bonnieux). We’ll stop along the way to visit L’Isle-sur-la-Sorgue’s market—one of the most colorful Provençal markets specializing in fresh salmon, ham, bakery goods, scarves, espadrilles (artisan shoes), linens, pottery, and organically grown fruits and vegetables. Tonight’s fresh, seasonal dinner at Le Mas de Guilleshotel—an old, converted farm estate—will be one to remember. We’ll meet the chef and his wife, who own the estate, and they will give us a tour of their herb garden before teaching us how to make a delicious French apéritif invented here on the estate. Activity & Distance: Cycling 28 miles. Approximate elevation gain: 2,200 feet. After breakfast, we have the option of visiting the Lourmarin morning market for an hour. This market is held in a captivating space and offers all the delights of the larger markets but in a more colorful, intimate environment. Following that, there will be shuttle to either the TGV station (high-speed train) in Aix-en-Provence or to the Marseille airport. This tour has been created in collaboration with our Partner ExperiencePlus! Bicycle Tours, a family owned and operated tour operator offering quality biking tours since 1972. Sisters Monica and Maria Elena have continued the family business and not only share our passion for great local food and wine experience, scenic cycling routes and passionate guides; they are neighbors and friends of ours with offices in both Italy and Colorado. ExperiencePlus! will assist in answering all of your questions and bookings for this tour.